Drug abuse has become quite an epidemic here in the United States. From the exploding growth of prescription drugs such as oxycontin, morphine, hydrocodone and other opioid type drugs to illegal drugs such as heroin and methamphetamemes. In recent years, we are also seeing a rise in chemically manufactured drugs. These drugs have powerful mind-altering affects and are used as a means of escape. Here in Colorado, marijuana has been legalized and we are seeing an increase volume of clients that have become dependent on the escape marijuana provides. The topic of legalization is incredibly complex and nuanced. There are certainly many scientifically proven medical benefits to elements of marijuana. This is less of a concern for treatment centers. The issue arises from abuse and dependence. Growers are also capitalizing on the brain altering effects of THC and growing strains with incredibly high amounts. 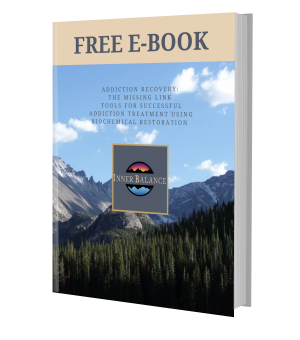 The clients we see struggle with moderation and become dependent on the drug. Addiction to drugs has many physiological components. Your brain and nervous system actually become dependent on continual usage of the drug to maintain every day living. Withdrawal can be dangerous and even deadly. Non-drug users often think withdrawal is simply a mental state. Locking someone in a room with no access to drugs is definitely not the answer to long term sobriety and can be extremely dangerous. At InnerBalance Health Center, every single person that comes in for treatment has a unique situation. We personalize our treatment program in a holistic fashion to reduce the cravings for drugs. We won’t be able to eliminate genetic issues but we can often help mitigate the impact with other supplements, improved diet and lifestyle changes. We understand the physical impact that drugs have and work with the patient to recover and educate them about the causes. Through our individualized treatment plans we are able to assess the specific needs of each patient and treat them accordingly. The following is a general synopsis of how the program works. Initially we begin the process with extensive laboratory testing to identify biochemical imbalances including genetics, histamine levels and nutritional deficiencies. These factors can lead to many symptoms addiction patients deal with including cravings, depression, fatigue and anxiety. Once identified we create a customized treatment plan for our patients to repair and balance their biochemical levels. Next we assist patients through the withdrawal process. We work to detoxify the body while simultaneously adding in nutrition and supplements. Our patients work with closely with on staff medical professionals, therapists and counselors to help make the transition as easy as possible. We also recognize the tremendous impact that spirit plays in recovery. This may be through church, support networks, nature or even deep connections to friends and family. We help you build and maintain healthy and loving connections to grow your spiritual self. Finally, we help you address your own personal environment. This may include an assessment of your surroundings, diet and even work. We recognize that we do not have total control over our environment but will help give you the tools necessary to create a positive and nurturing environment for yourself.